Each month, EPMSA will dig through the East Point Historical Society's archives to provide you with that month's "Flashback Feature". 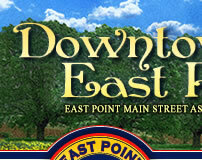 Each feature will highlight a photo and/or article from East Point's vibrant history. The photos/articles will give you a brief look at East Point back then . . . more information about East Point's history is available at the East Point Historical Society located at 1685 Norman Berry Drive, East Point, GA 30344. You can contact them at (404) 767-4656 or visit www.eastpoinths.org. All "Flashback Features" will be archived on the website and can be accessed at any time. Railroad section crews performed the back-breaking work of maintaining and realigning the tracks and were often referred to as "Gandy Dancers." Per a wikipedia.org reference, "there are various theories about the derivation of the term, but most refer to the "dancing‘ movements of the workers using a specially manufactured 5 foot 'lining' bar (which may have come from using tools from the Gandy Manufacturing Co. of Chicago, U.S.A.) as a lever to keep the tracks in alignment. However no one knows for certain where the term originated." Crew leaders would often use call-and-response songs to maintain a rhythm, synchronizing the "spiking and lining" of the rails by the crew. A film featuring recordings of Gandy dancer work songs can be found on www.folkstreams.net. 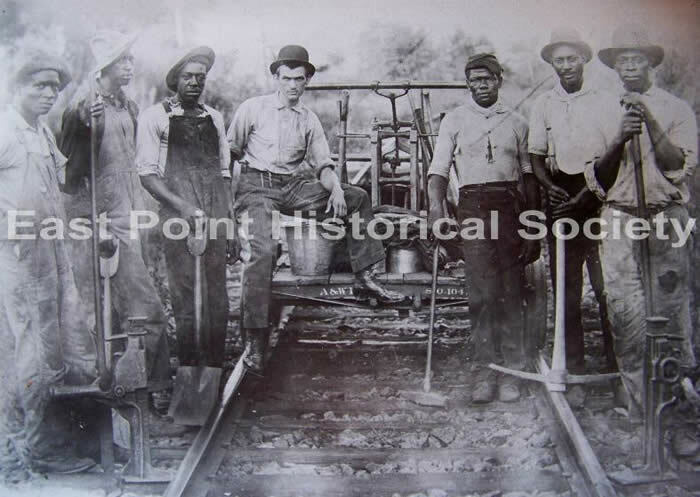 Above: Photo (circa 1910) of a railroad section crew of the Atlanta & West Point (A&WP) Railroad. - Thursdays 1 - 4 p.m., Saturdays 11 a.m. - 3 p.m.